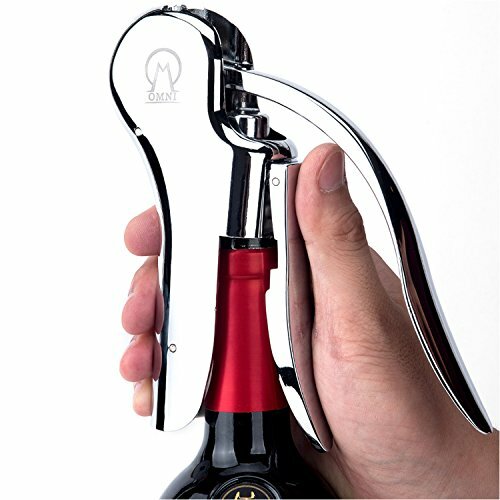 OPEN ANY BOTTLE QUICKLY AND EFFORTLESSLY - The Omni Wine Opener's lever pull mechanism is designed to easily open any bottle of wine in three seconds flat, all with one smooth up and down motion. Don't break a sweat twisting or yanking at your corkscrew anymore with the Omni Wine Opener Set by Vintorio. PULLING CORKS MADE SIMPLE, FROM START TO FINISH - The Omni Wine Opener Set comes with a FREE foil cutter with four razor sharp circular blades that makes removing tough wine foils seals a breeze. After use the Omni Wine Opener's cork ejection system automatically releases the cork with one more up and down pump. STURDY AND RELIABLE MECHANICAL DESIGN - The inner components of the Omni Wine Opener are fully mechanical and are made of durable stainless steel parts. Eliminate the hassles of struggling with electrical defects and power failure issues! The Omni Opener promises peace of mind and a reliable pull every time. BEAUTIFUL AND BRILLIANT CHROME PLATED FINISH - The temptation to try out your new Omni Opener will be irresistible as soon as you open the premium gift box packaging. The quality of the Omni Opener will be unmistakable as soon as you touch its sleek and cool chrome plated finish. Impress your guests with the Omni Wine Opener Set.